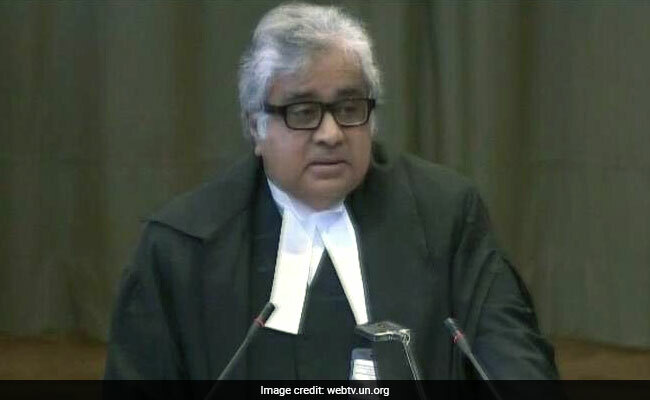 Harish Salve told NDTV that it was a "huge decision" for the government to move the International Court, in which External Affairs Minister Sushma Swaraj "led from the front". Harish Salve spoke of the possibility of approaching the International Court of Justice. New Delhi: Good planning and secrecy - that's what Harish Salve said gave India the edge over Pakistan at the International Court of Justice. Two days after the former Solicitor General's masterful presentation of the case at The Hague, the world court ruled in India's favour, asking Pakistan to hold off the execution of Mr Jadhav till it reached its final verdict. Mr Salve, who is being congratulated since by everyone, from Prime Minister Narendra Modi to netizens on Twitter, told NDTV that it was a "huge decision" for the government to move the International Court, in which External Affairs Minister Sushma Swaraj "led from the front". "If we had made a false start, we would have been where Pakistan is today," Mr Salve said. Talking of the secrecy with which everything was planned, he said, "No emails were sent, everything was kept quiet, that's how we had a little advantage when we moved the court". In anticipation of India's move, Pakistan had already attempted to curtail the ambit of issues on which it would accept the decision of the International Court of Justice. But while giving its preliminary verdict today, the court said it has "no limitation" to consider the case. Its decision, the court said, would be unanimous and binding. The sequence of events, Mr Salve said, had started with an interview to NDTV, where he spoke of the possibility of approaching the International Court of Justice. "I think somebody picked it up from there and so the External Affairs Minister called me up and said give me two days' time," Mr Salve said. It was the middle of April. "There were some efforts which we were trying to make... because see, jumping to the ICJ - if we had made a false start - we would have been where Pakistan is today... so it was a huge responsibility and we had to time it perfectly," he said. It was finally decided that India would approach the court on May 8. Mr Salve, who was leading the battery of lawyers who were crafting the plan, went to The Hague and met the registrar. "I convinced him of the urgency, we were very happy - within two days President Ronny Abraham passed the first order and gave us the (date of) 15th"
On Thursday, the court decided in India's favour, agreeing that Pakistan had illegally withheld consular access to Mr Jadhav, whom it had accused of spying. The Vienna Convention has provisions for consular access to accused even in cases of terror and espionage, the court said. The court asked Pakistan to use every means at its disposal to hold off Mr Jadhav's execution till it reaches a final verdict. "I am satisfied today that court has accepted most of which we put forth," Mr Salve said.